A few days short of the vernal equinox, Mother Nature does indeed appear to be in a spring-like mood. Puddles and grassy patches are beginning to abound where the snow has melted, and migrant birds are beginning to return as residents are vocalizing their full spring repertoires; that being said, high temperatures this week never quite reached the 50’s here in St. Peter, and most mornings have hovered around the freezing point of 32 degrees Fahrenheit. Tomorrow is forecast to reach a high above 50 degrees Fahrenheit — which translates into even more melting snow — and with rain in the forecast for much of next week (including thundershowers on Sunday) we should see the white stuff disappear altogether in the near future. Unfortunately the prediction of cooler temperatures appears to hold for at least the first week of spring, as it looks like we’ll have trouble breaking even 40 degrees Fahrenheit after Monday (which, I daresay, could promote a little snowfall). The first official flood warning is now out for the Minnesota River in south-central Minnesota — and that includes St. Peter. Current predictions are that this flood will attain at least the level of last spring’s flood, which closed the Hwy. 99 bridge heading east of St. Peter but only encroached on Hwy. 169 north and south of town in addition to Hwy. 22 heading southeast. With probable rain in the forecast, however, this year’s flood is likely to exceed the 2010 crest, and thus we may see road closings and flood water conditions more similar to last fall (in which the only open direction leading out of St. Peter was west). Flood stage here in town should be achieved sometime in the first half of next week, and then a possible crest is more likely sometime around next weekend. 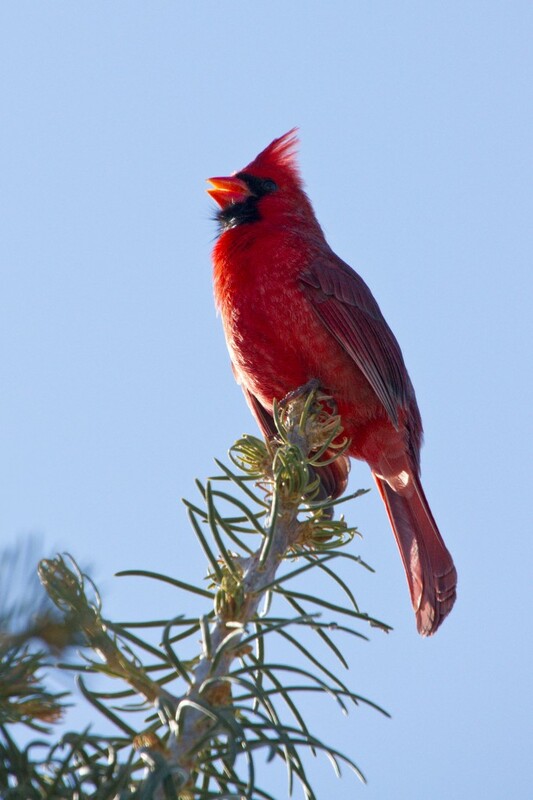 Northern Cardinal singing from atop White Fir in front of Interpretive Center, 3/16/11.